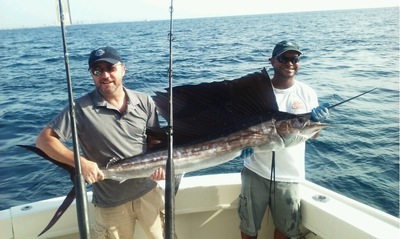 We continue to experience few surprises on our Ft. Lauderdale fishing charters as we begin the month of August. Now deep into the summer months the fishing patterns have been pretty consistent with the reef line areas still providing the most action. Good sized school Kings are available just off the reef and have provided some good action and at times very good action for our anglers. Every day is a bit different but we are catching fish. Bonito continue to get into the mix on both the surface and deep lines. The Wahoo have backed off with the fading moon but we did manage a couple more. Off the edge continues to be a bigger challenge as the Mahi-Mahi while being a summer favorite of most everyone, continue to be scattered and often in very deep water now and not a sure bet. Getting out there into the deep and finding them is certainly rewarding, but they can be elusive. A good choice for the Mahi lovers might be a Swordfish charter which takes us a ways offshore and hopefully encounter the Mahi while enroute to the Swordfish areas and then also the possibility of on the return trip having a crack at them. While warm the sea conditions are comfortable. Nice Sail in the photo with Mike and 1st mate Dave. This fish was hooked on a trolled bait right along that reef line in 120 feet of water about a mile off the beach. An unusual number of Sharks along and just off that reef line as well with some being quite large. Hammerheads, Duskies and Bulls along with the usual Sandbars.